The National has only released six studio albums and a handful of EPs since 1999, but the quintet's impact on American rock in 2016 feels far more pervasive and powerful than the scope of a discography. What is the band's ineffable strength that has made every release from the National as resonant as a great contemporary novel? Perhaps it's that tricky sibling effect: twin brothers Aaron and Bryce Dessner are an indefatigable tag team, zigzagging between their own work, side projects, collaborations, and production duties. The brothers Devendorf, bassist Scott and drummer Bryan, add a crafted, taut foundation to the National's rhythm section. And singer Matt Berninger's rich, gloomy baritone has cast him as a universal narrator of existential angst, a quality that became even more evident when Berninger's brother Tom shot a revealing, pleasantly shambolic documentary about the National, 2013's "Mistaken for Strangers." There's nothing predictable about the National's trajectory either. They certainly weren't an overnight success. All five members hail from Cincinnati, Ohio, but really began playing together in Brooklyn. But, like a lot of scrappy New York bands struggling for recognition, the National were shunted to the side, while harder-rocking bands like The Strokes or Interpol ascended. The National didn't have the best timing either; their self-released, self-titled debut album came out six weeks after September 11, 2001, a somber time for their adopted city. But with prescient sensitivity, the National tapped into that grief-stricken, overcast, chaotic mood that was pervasive in a post-9/11 world. The band's songs reverberated with a melancholic majesty, exquisitely arranged like classical opuses. Not surprisingly, it was in France—a country that readily embraces battered anti-heroes—that the National found a nascent foothold: the band's first real label, which released their second album, 2002's Sad Songs for Dirty Lovers, was the Bordeaux imprint Talitres. From the slow burn of 2005's Alligator, the album which most efficiently broke them to a wider audience to the brutal, withering observations of songs like "Sin-Eaters" from 2010's recession-era masterpiece High Violet, the National have never brightened their dusky, grey canvas with pastel platitudes: a disquietude lurks beneath their ornately pretty music. The arc of adulthood and its tougher responsibilities and epiphanies is splayed across their six albums too—the wary, sort-of-young men of 2007's Boxer dove deeper into a grizzled abyss with the release of 2013's Trouble Will Find Me. The National's members have nurtured a diverse network of collaborators via their many, many outside projects too: the recent release of the epic Day of the Dead collection, to benefit the Red Hot organization, was a four-year labor of love that roped in about 60 artists; a music festival harnessed within one collection. The ever-busy Aaron Dessner has produced albums for Frightened Rabbit, Sharon Van Etten and Local Natives and, along with his brother Bryce, runs Brassland Records. They were commissioned by BAM's Next Wave Festival for The Long Count and together have embarked on dozens of concerts and recordings with an array of collaborators, like the Icelandic band Múm, the Copenhagen Philharmonic, and the Amsterdam Sinfonietta. On his own, Bryce Dessner debuted a choral work, "Black Mountain Songs," at BAM in 2014 and worked with Ryuichi Sakamoto and Alva Noto on the Golden Globe-nominated score for Alejandro G. Iñárritu's epic 2015 western "The Revenant." In addition, Matt Berninger and Menomena's Brent Knopf founded another band, EL VY, and released their debut, Return to the Moon, in 2015. And Scott and Bryan Devendorf have hooked up with Beirut's Benjamin Lanz for their own side project, LNZNDRF. The trio's self-titled first album came out in the winter of 2016. The National is a grand sum of its fascinating, restless parts, fueled on the artistic vision of five men devising music which astutely reflects the despair and dreams of this temperamental country. The Dessners, Devendorfs and Berninger are contradictions too: family members and total outsiders, flitting between rock and classical, mainstream and the esoteric. 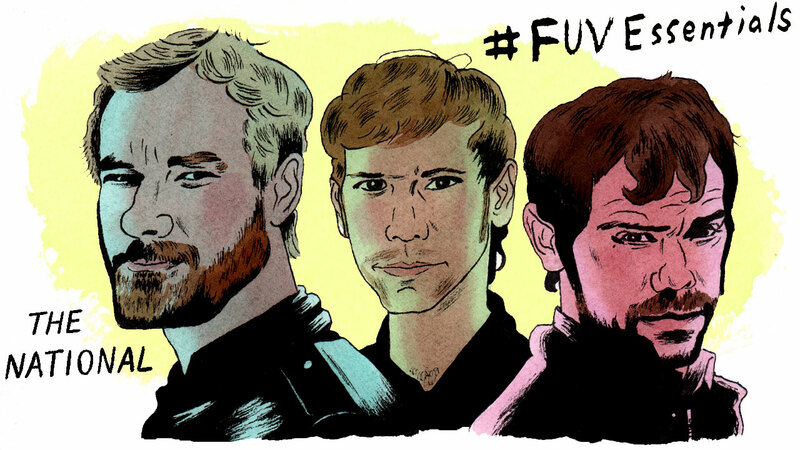 They are alt-rock avatars of the present and future of music and it's why the National is one of our FUV Essentials.